We are amongst the most reputed names in the industry, offering Zipper Making Machine. We are engaged in offering Zipper Making Machine. 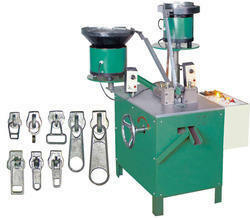 size is 3" and 5"
We deal in used zipper machines as well as brand new zipper machines . We have 30 years experience and can assist in complete setting up of a zipper or a monofilament factory . Zippers are a lucrative market with very high demand in India and many developing nations .